The life of a painting can be pretty unpredictable. Some are constantly on the move, reaching different parts of the world as they travel through time. When I started at the Getty as an intern, I had only recently returned from a long voyage to Paris. During my first week here, a fellow European traveler appeared in our midst: a small, 18th-century painting by the Venetian artist Pietro Longhi, which goes on view this morning in the galleries at the Getty Center. The painting has been in many places since the 1740s, but it was born and raised in Venice. In Longhi’s time, Venice was a popular destination for wealthy Grand Tourists, who often bought paintings showing vistas of canals and distinctive Venetian buildings by artists such as Canaletto or Bellotto. Longhi didn’t work in this genre; instead, for inspiration he turned to the privacy of patrician homes and the spectacles of Venetian society. Longhi wanted to show the world as it was. The Painter in His Studio shows the intersection of two social realities. 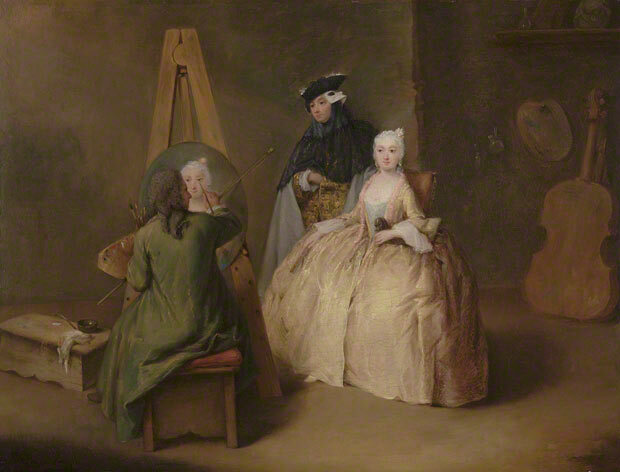 The painter is at work with his palette and brushes, while a young woman engages in the common aristocratic practice of sitting for a portrait. Who is this young man with veil and mask? But of course, there’s more to the story. Who is the young man in the strange get-up consisting of, among other things, a semi-transparent lacy veil and a white waxed-cloth mask pushed to the side of his head? During Carnival, which could last up to six months of the year, men and women alike would wear costumes consisting of an ankle-length cloak, a veil topped by a tricorn hat, and a beaked mask that allowed the wearer to eat, drink and breathe comfortably. This outfit provided an incognito for those who wanted to remain anonymous at the gambling house (known as the Ridotto, derived from the Italian for “to reduce one’s wealth by gambling”). The masks had a democratizing effect, allowing noblemen and commoners to rub elbows in cafés or while watching quack doctors present their latest curiosities in the city squares. For aristocrats, like the Englishman pictured below, masks offered license to engage in an amorous affair or two with impunity. The public masquerade was hugely popular; wealthy tourists and even eminent princes visiting Venice donned the costume to partake in the festivities. 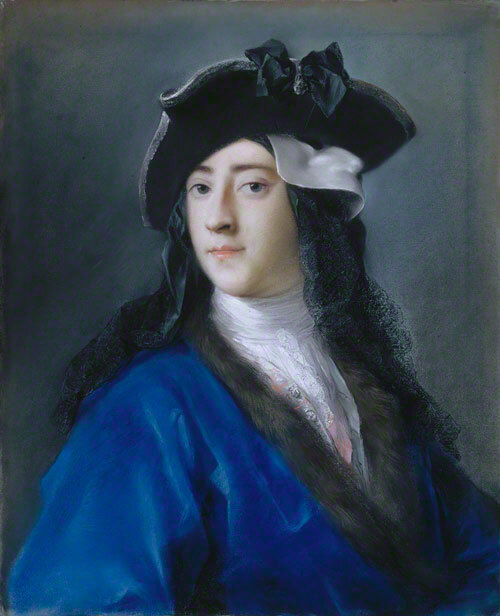 Gustavus Hamilton (1710–1746), Second Viscount Boyne, in Masquerade Costume, Rosalba Carriera, 1730–31. Pastel on paper, laid down on canvas, 22 1/4 x 16 7/8 in. 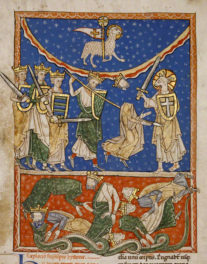 The Metropolitan Museum of Art, Purchase, George Delacorte Fund Gift, and Gwynne Andrews, Victor Wilbour Memorial, and Marquand Funds, 2002 (2002.22). 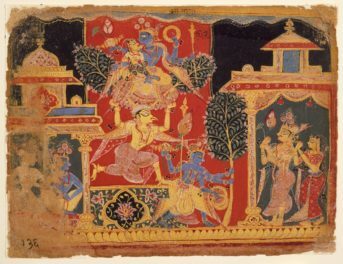 Image © The Metropolitan Museum of Art. Reproduction of any kind is prohibited without express written permission in advance from The Metropolitan Museum of Art. Our young man, then, is a figure Longhi plucked directly out of the world around him, a Venetian aristocrat pausing at a painter’s studio between masked public appearances. Longhi successfully shows us just how ordinary this is for the cicisbeo. His casual stance, with a hand tucked into his waistcoat, suggests his nonchalance as he watches the painter work, while the mask’s placement on the side of his head demonstrates that he is at ease in this costume. 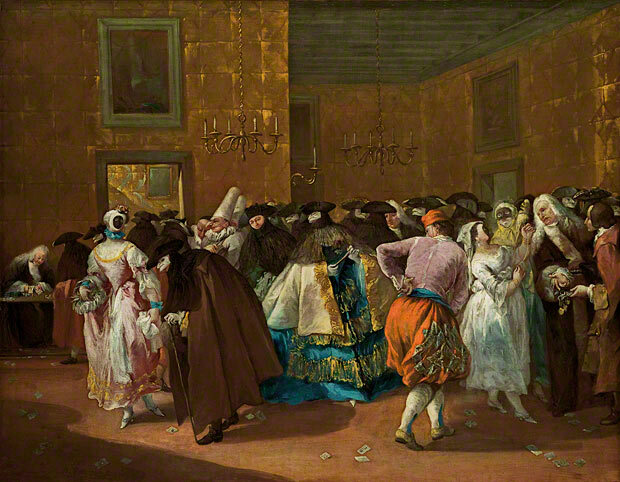 Longhi’s painting prompts me to consider how the aristocracy actively participated in a fiction of anonymity. In the end, no one was actually unrecognizable in their masks—and no one even really wanted to be! 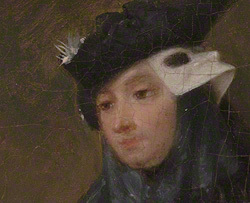 The whole outfit was another opportunity to show off wealth: the lace of the veil was expensive, and the cloak or hat of a nobleman was of noticeably higher quality than that of a lower-class citizen. The lumpy shape supposedly afforded by the cloak could not possibly disguise the gender of the wearer, considering the women’s voluminous dresses. For all the allure of a full disguise, the aristocrats of Venice were happy to wear their taste for luxury literally on their sleeve. The masquerade worked marvelously, not because the disguises were effective, but because everyone was in on the game. Agreeing not to recognize each other, no matter how evident each identity was, meant absolving each other of all mischievous behavior otherwise frowned upon. Our more-or-less disguised young man tells us the peculiar story of a society where a married woman openly spent more time with her cicisbeo than with her husband, while gambling aristocrats insisted on using an incognito that everyone saw through anyway. Everyday life in Venice was full of these odd moments of concealment and revelation, and Longhi describes it all in this painting. Spending so much time with The Painter in His Studio made me regret that I didn’t go to Venice during my own European Grand Tour. But then it occurred to me that Longhi could never have imagined that his painting would ever live so far away from his native city. Yet here we are, 270 years later, admiring it in a museum on a California hilltop. The painting can now call the Getty its home, while remaining an ambassador of Venice. Without ever having seen Venice, I am transported to this curious city and begin to feel as if I know it personally. Physically and temporally far from its origins of tiny aristocratic dogs and masked figures, Longhi’s panting invites us to travel through time, to feel irresistibly a mask at the side of our head and to marvel at all the places we can go. Perhaps it was Casanova wearing the mask? I saw this painting last summer, and I’m very interested in the double bass in the corner. I wonder if bit wasLonghi’s bass? Or maybe the cicisbeo was also a bass player? Boots, the instrument (which, if memory serves me, is a cello) would have been in Longhi’s studio, ready to be used as a prop for a different sitter. 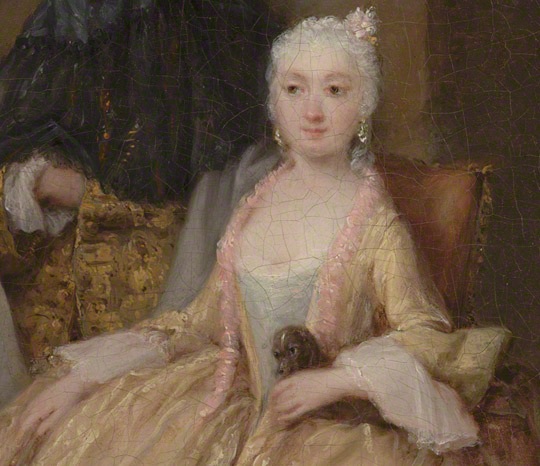 Artists like Longhi would have had various “accessories” that they could provide for their sitters, depending on the personality or profession the sitter wanted to convey. That’s why the instrument is leaning against the wall displaying other attributes of the painter.